It’s been seven years since their mother left them to their great grandmother. Seven years since Naomi and Owen León have seen their parents. It has been been seven years until now, their mother has come back to see them. 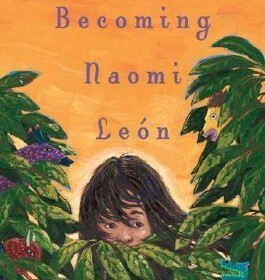 Becoming Naomi León by Pam Muñoz Ryan is a book that grabs you in the beginning and does not let go. It is about a family piecing itself back together after seven years of being apart. The story is told from the perspective of Naomi Soledad León Outlaw, an eleven year old girl who was raised by her great grandmother. Gram has taken care of Naomi and her brother Owen, ever since their mother left them. Naomi and Owen live peacefully with Gram, that is until one day their mother shows up looking for her children. Naomi doesn’t know what to think of her mother. Since she left Naomi and Owen she has changed her name from Terri Lynn to Skyla, started dying her hair different colors, and has a strange new boyfriend named Clyde. Soon after Skyla makes her arrival Naomi faces a much bigger problem than the boys in her class teasing her. Skyla wants to take Naomi away from Owen and Gram and their trailer in Lemon Tree that they call Baby Beluga to live in Las Vegas with Skyla’s new family.Clyde, and Clyde’s daughter from his second marriage. Skyla is still Naomi’s legal guardian and can take her to Las Vegas with her if she wants to. Naomi, Owen, Gram, and their neighbors Fabiola and Bernardo embark on a trip to Mexico in search of Naomi and Owen’s father. They do this because finding him would be the only way for Gram to keep both children, and win when they go to court with Skyla and Clyde. This book is realistic fiction and filled with constant twists that are completely unexpected. I would recommend this book to readers who enjoy short yet impactful reads. I would also reccomend it to those who read Pam Muñoz Ryan’s Esperanza Rising. Both books are about young girls facing obstacles, both have a main theme of family, and both provide insight and interesting facts about Mexican culture. This book is beautifully written, full of unexpected suspense and I would definitely recommend it.